I picked up this mini set of Essie nail polishes in the Boxing Day sales and completely forgot about them until this week! I don’t know how I forgot, because they’re such gorgeous shades. I initially was trying to find a full sized version of the red glitter Leading Lady, but just after Christmas, it was no where to be found. But then I spied this mini set on ASOS reduced from £16.95 to £12.50 so I bought it because I really wanted Leading Lady. However, once it arrived, I actually realised how much I adored all of the shades! Even at £12.50, it’s still a little more than I would usually spend on nail polish, but I bought it as a little treat for myself, and just over £3 each isnt too bad. 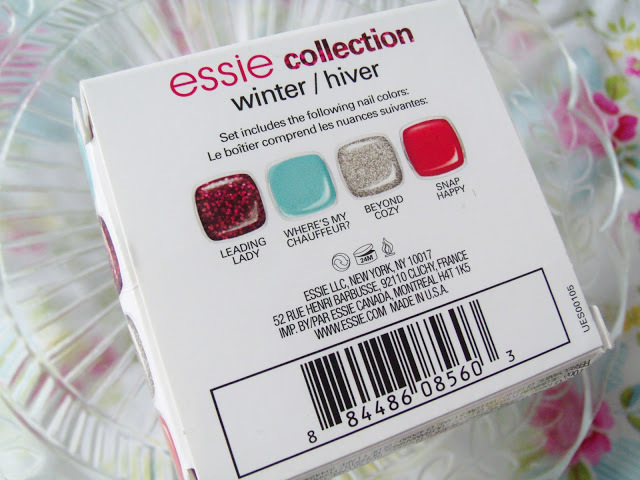 The set is called the Essie Winter Mini Collection 2012 and consists of the following four shades: Leading Lady, Snap Happy, Where’s My Chauffeur, and Beyond Cozy. The colours are all very rich and luxurious, and the sheer ones apply so smoothly! 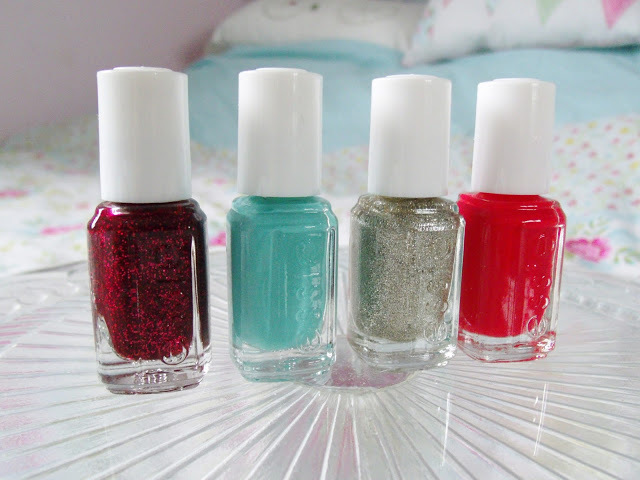 And the glitter polishes are very pigmented (if nail polish can be so?!) and super festive. 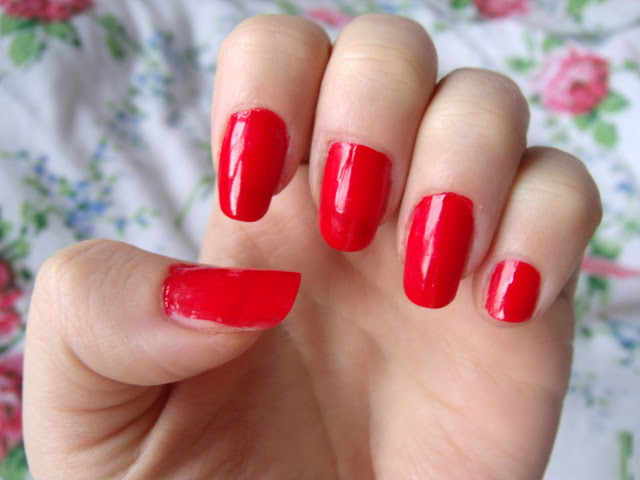 Leading Lady is a very deep red polish which contains many tiny glitter particles to create a Christmassy nail look. I love Where’s My Chauffeur, it’s a very Tiffany blue shade and looks beautiful, and I think would also be suitable for summer. Beyond Cozy is a gold glitter polish, and Snap Happy is a super bold red orange shade which is very eyecatching. 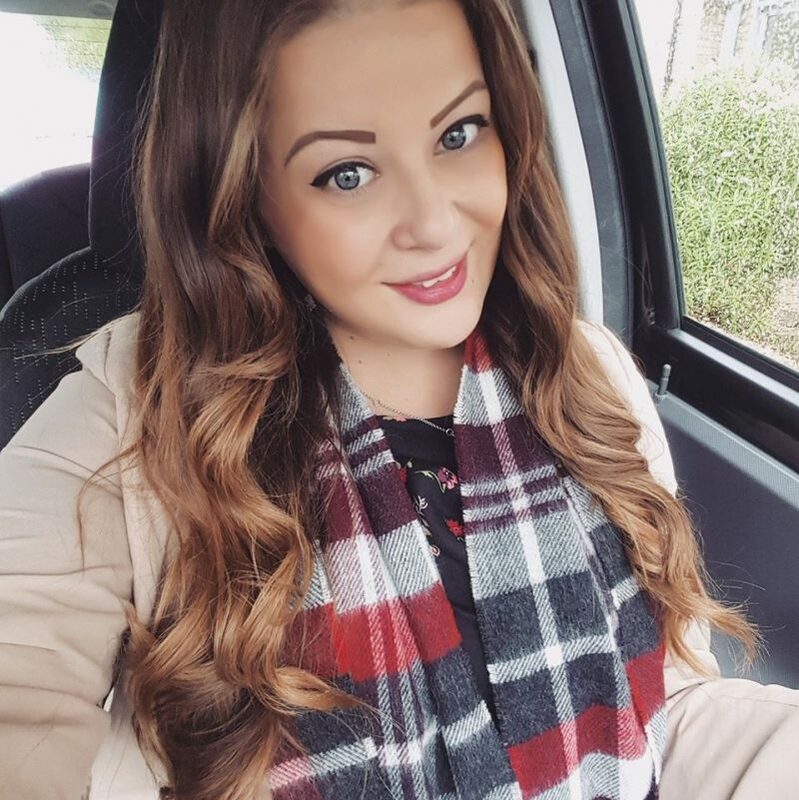 I’ve been wearing Snap Happy this week and I love it! It’s such a bright colour and it cheers me up in these wintery days. The set is out of stock on ASOS, but you can actually buy it cheaper from Beauty Bay for only £11 with free delivery. Ooooh. Where's My Chauffeur looks so pretty. MUST stop buying more blue, haha. See I thought about getting this set but decided I didn't need them all and just got a full sized Leading Lady but I keeo seeing it and I wish I had the other shades, not to mention I have so many polishes thast the chances kf me getting through the whole of leading lady are slim whereas minis are much more achievable. Beyond Cozy is something in my taste 🙂 I didn't try nail polish from Essie yet, it will be very fun to do it! Ah these colours are so lovely! I really would love to try leading lady, heard many a good thing about them! I think the blue is really lovely as well, very spring! Might have to have a cheeky purchase of these myself!